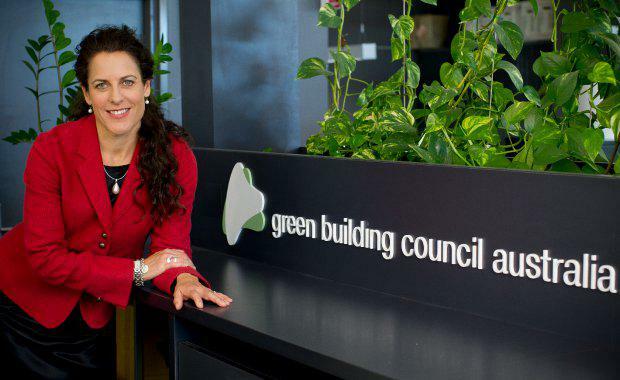 Romilly Madew, chief executive of the Green Building Council of Australia, has been awarded the prestigious World Green Building Council Chairman’s Award for her work in advancing sustainable building globally. The WorldGBC Chairman’s Award honours people who have contributed to the transformation of the global property and construction industry. The chairman of the World Green Building Council, Tai Lee Siang praised Madew’s role in establishing several green building councils – including the New Zealand, South African, Hong Kong and Indonesian GBCs. In a ceremony in Jaipur, India, on Wednesday Siang also paid tribute to Madew's long service on the WorldGBC board of directors, and work to establish the Asia Pacific Green Building Network. “This award also acknowledges Romilly’s efforts to champion equality and diversity throughout the green construction industry,” Siang said. Madew joins an pre-eminent list of previous Chairman’s Award winners, including Sir Timothy Smit of the Eden Project (2012); Qiu BaoXing, former Vice Minister of the Chinese Government’s Ministry of Housing and Urban Development (2014); and Rick Fedrizzi, former chief executive of the US Green Building Council and current chief executive of The International WELL Building Institute (2016). Madew was chosen as this year’s winner for her tireless commitment to sustainability, and her inspirational leadership. “Since 2006, Romilly has been at the forefront of a global movement to change the shape of our buildings, communities and cities,” Siang said. Accepting the award, Madew said she was honoured to play a role in shaping the world’s greenest real estate sector. “Just last month, GRESB, the global real estate sustainability benchmark, ranked Australia the global green leader for the seventh year in a row. “To me, this award acknowledges the leadership of our industry, which is committed to delivering enduring value to communities and investors while creating a better future for us all.” Madew said. At the helm of the GBCA for more than a decade, Madew represents 650-plus individual companies with a collective annual turnover of more than $40 billion. Under Madew’s leadership, the GBCA has certified more than 1,715 sustainable buildings, communities and fit-outs under the Green Star rating system. Importantly, these buildings consume 62 per cent less energy than non-Green Star buildings, emit 66 per cent fewer greenhouse gases and use 51 per cent less water. They are also healthier and more productive places – with a raft of evidence finding Green Star buildings can boost productivity by up to 15 per cent. Today, 37 per cent of Australia's office space has Green Star certification. Schools, hospitals, libraries, community centres, apartments, industrial facilities and the Sydney Opera House have achieved Green Star ratings. More than 1.3 million people visit a Green Star-rated shopping centre each day and 42,000 live in Green Star-rated apartments. In addition, 420,000 people are moving into Green Star communities, the same number that live in the nation’s capital.